Prothrombin Time (PT) is the time in which your liquid portion of blood (Plasma) takes to clot. The PT Test is performed to estimate the ability of the plasma to clot in order to detect a bleeding disorder or clotting disorder and to monitor the effects of anticoagulant medication, Warfarin. 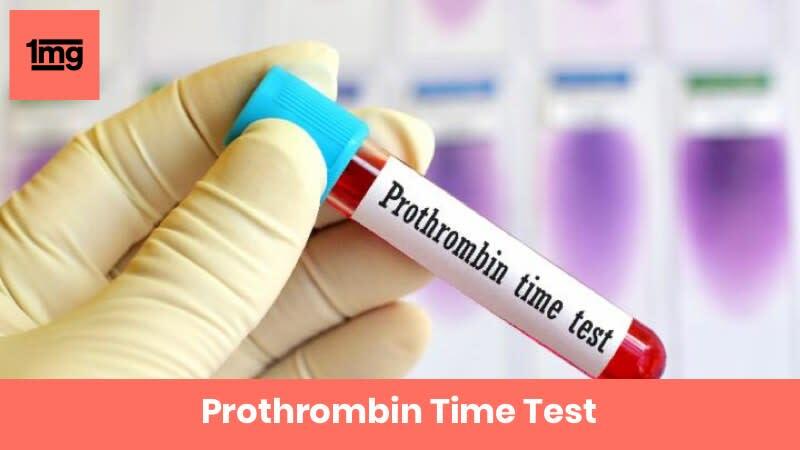 The Prothrombin Time (PT) Test measures the ability of the plasma to clot in order to detect a bleeding disorder or clotting disorder and to monitor the effects of anticoagulant medication, Warfarin. In case of any bleeding, the body responds to stop the blood loss as quickly as possible by forming a blood clot. This process of blood clotting or coagulation is called hemostasis and involves a series of chemical reactions in the blood (coagulation cascade) which activates blood proteins called coagulation factors one after another, in a series. The activated coagulation factors lead to the formation of fibrin mesh around the platelets and other blood cells at the site of bleeding and this complex hardens to form a “blood clot”. Coagulation cascade proceeds by two pathways, the intrinsic pathway, and the extrinsic pathway. These pathways later merge together into a common pathway. Prothrombin (Coagulation Factor II) is converted to its active form thrombin in one of the reactions. The PT Test assesses the functioning of Blood Coagulation Factors I, II, V, VII, and X, which are parts of the extrinsic and common pathways by measuring the time taken for conversion of prothrombin to thrombin. The Activated Partial Thromboplastin Time (aPTT) Test measures the functioning of Blood coagulation Factors I, II, V, XII, VIII, IX, X, and XI, along with other factors Prekallikrein (PK), and High Molecular Weight Kininogen (HK) which form parts of the intrinsic and common coagulation pathways. The PT and aPTT tests are usually performed together and the results of both are evaluated simultaneously to determine the rate of blood clotting. Warfarin is prescribed in the treatment of conditions caused or worsened by excessive blood clotting like Deep Vein Thrombosis (blood clot formation in blood vessels), irregular heartbeats, etc. The PT test is also performed to evaluate the effectiveness of Warfarin treatment. When performed to determine Warfarin efficacy, the result of the PT Test is expressed in terms of a measurement scale called the International Normalized Ratio (INR). Since the PT Tests are performed using different reagents in different labs giving rise to widely varying results in other conventional units, the INR system was created to maintain uniformity in the results. Prothrombin time longer than the normal range indicates a bleeding disorder where blood takes a longer time to clot. Prothrombin time shorter than the normal range indicates a clotting disorder where blood takes lesser time to clot. Normal hemostasis usually. However, normal results may also appear in a mild reduction in coagulation factor activity and mild cases of Von Willebrand disease. Q. Is there any preparation required before the PT test? Inform the doctor of any medications you may be taking as medicine like aspirin, some steroids, etc. can affect clotting time. If the test is performed to monitor Warfarin therapy, sample collection is performed at the same time of the day every time to ensure uniformity of results regarding Warfarin dosage. No other specific preparations are usually required before the Prothrombin Time Test. Q. What factors can affect the PT test results? Q. What additional tests can be prescribed by your doctor in case of abnormal PT test result? Q. What diseases can affect blood clotting to cause bleeding disorders? Q. What are some apparent symptoms of bleeding or clotting disorders?